Profiles are quite important to getting good prints, especially with the variety of papers available and pigmented inks are far more finicky than dye inks. With digital printing becoming so popular and commonplace and with the advances being made in digital printing in the last few years, profiles are becoming quite readily available. Most of the major paper manufacturers have profiles available on their websites for their media with different printers. Epson also has profiles on their website for some of their papers. These manufacturer profiles are generally good but not as good as custom profiles. If you do some searching around on the net you can find better ones available that people have made. Making your own profiles is good as you'll get decent results from scanner based profiles. But to get really top notch results you need to use a spectrophotometer which reads the prints directly and is much more accurate than a scanner. NO! I'm not saying you need to run out and buy one. Once you have your profiles loaded, the key is using them properly. Making them part of your workflow is important. When you get ready to print, have made all your adjustments and such, go to Image>Mode>Convert to Profile and select the profile of the paper you're printing on. This will change the color profile of the image to fit the gamut of the paper you're printing on. Then you can go to View>Gamut Warning. This will tell you if anything in the image is outside the color gamut of the media and you can make further adjustments if you want. When you go to print, and if you're using the Epson drivers, go to File>Print with Preview>Page Setup>Printer>Properties. If the Advanced Screen doesn't come up automatically, click on Advanced and click on the Show This Screen First box. From here, select your media type from the dropdown menu, then turn off High Speed Printing and Edge Smoothing if they are on by default. Over on the right side under Color Management, for Color Controls set your Gamma (2.2 for Windows, 1.8 for Mac), Color Mode=Standard and make no other changes. Then click on PhotoEnhance and set Tone=None and Effect=None. Lastly, click on ICM and choose No Color Management. This last step is important. Since you've already set the image profile to the paper profile which effectively is your ICM color management adjustment, you don't want the printer drivers making changes to it. 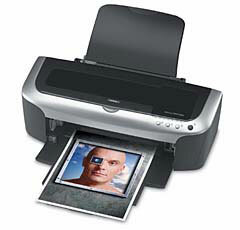 The reason is that the profile in the Epson printer driver is only the Epson profile for that paper. You're using your custom profile so you don't want the printer driver to modify it to the Epson canned profile. With regards to a colorspace, use Adobe RGB, as sRGB is a more compressed space (not a lot but somewhat). Use Adobe RGB as your working space when editing images. You'll convert to the paper profile when printing which will have a different colorspace than Adobe RGB, but you'll retain as much color as possible. I suspect that many people use sRGB because that's what many digicams use. If you have the option of using Adobe RGB then my suggestion would be to do it. If you capture images in RAW mode then you can set whatever colorspace you want when you convert. Note: You don't necessarily have to readjust the image for each paper type. All you need to do is keep your original file and convert it to the profile for the paper you're using. Just because a part of the image is out of the range of contrast/tone/brightness of the paper doesn't mean you have to adjust the image. It's optional and unless it's a significant or important element, probably not necessary at all. Unless it's a significant difference you're unlikely to notice it in the final print anyway and on a well exposed/edited image it's more probable than not that the paper gamut won't be an issue.